Another 3 wins & 2 nominations. 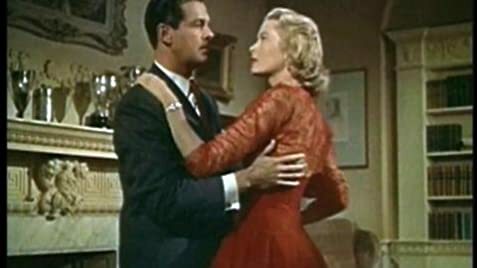 Tony Wendice (Ray Milland), an ex-tennis player, unhappily married to Margot (Grace Kelly), correctly guesses that she has been cheating, with Mark Halliday (Robert Cummings). Mark writes crime stories. Unbeknown to Margot and Mark, Tony knows about the affair, and wants to teach Margot a little lesson, by taking away the thing that is her life. But, being too guileful to do it himself, Wendice blackmails one of his old school friends into murdering her, and the essential thing to doing it is his latchkey. Dial M for Murder succeeds on many levels, and it is largely thanks to some superb dialogue, written from a tricksy-yet-capable script that never gets too deep. The cast are a treat. Ray Milland is an absolute gem, extremely sly and dispassionate, yet a character so full of self-assurance that one almost sides with him. Grace Kelly completes her great year (she gave an Oscar-winning performance in The Country Girl and also starred in Rear Window) by emanating the poised, beautiful being, that is vulnerable, yet oddly unassailable. And it's weird in that even though she's cheating on her husband, you care for her a lot more than him (although that could do with the fact that he's trying to kill her...) And John Williams, as the police detective, is quite wonderful. Alfred Hitchcock manipulates and enthrals his audience here like the master that he is. Each scene has a sense of direction, great pacing, and is staged realistically. Stunning full colour photography and a haunting, atmospheric score from Dimitri Tiomkin complete this great package. The ending, when it comes, feels a little too nice to be truly realistic, but that is my only major quibble with an otherwise highly entertaining, thrilling movie. John Williams won the 1953 Tony Award (Broadway) for Best Featured Actor in a Play for "Dial M for Murder" as Inspector Hubbard. He re-created the role in this movie. The handkerchief in Hubbard's top jacket pocket changes shape during his first scene with Mark, Tony and Margo. The title is shown on a background of a British telephone dial; its MN/6 marking is replaced by a single large M which forms the single M of the title. The film had an intermission in its original 3-D release, although it is less than two hours, in length.